Printing from your laptop or mobile device is available from all campus libraries for patrons with a Cal1 card. If you have a Guest Card, printing is only available from a public workstation computer. 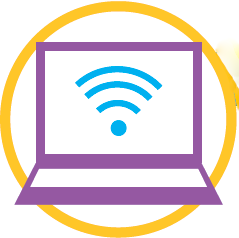 Connect to the internet via a Campus network such as AirBears2, CalVisitor, eduroam. Sign in using your CalNet ID (ex. jsmith). Maximum file size is 20 MB or 20 pages in a single print request. If file size exceeds 20 MB, upload will succeed but the job will fail at the print release station. Navigate to and select the document that you would like to print. If you want to print a legal or tabloid size document, it must be saved as that size before uploading to mobileprint. The print job may take up to a minute to be available at print stations. Tap your Cal1Card on the black card reader at any Library printer to retrieve your print job. Select your print job on the print station monitor. The cost for your job will be displayed. Click on "print." Color printing is available for letter sized documents. If you need to print other sizes in color, use a library workstation or go to the Moffitt Copy Center. What kind of files can I print? Wireless printing is available for Microsoft Word, Excel, PowerPoint, Visio, PDF, text (CSV, RTF and TXT) and images (JPG, TIFF, GIF, BMP). How long will my job remain in the print queue? Job queue will be held for 2 hours before being purged. Does the item I’m printing have to be on my laptop or mobile device? Can I print an email or webpage? You may need to save the email, web page, etc. to your device or to cloud storage such as Box.